ENGLEWOOD, Colo. (AP) — The Pittsburgh Steelers bring the best wide receiving combo and top tight end twosome into Denver this weekend. Countering all that is the league’s most prolific pass-rushing pair in Von Miller and rookie Bradley Chubb . Miller, coming off his 100th career sack, and Chubb, the fifth-overall pick in the draft last April, have combined for 19 sacks, 21 tackles for loss, 29 QB hits, five forced fumbles, two fumble recoveries and one interception. That takeaway last week in Los Angeles, when Miller picked off Philip Rivers , was a game-changer and maybe even a season-turner for the Broncos (4-6). They had lost four games to the league’s heavyweights by a combined 12 points before eking out a 23-22 win on Brandon McManus‘ field goal as time expired in Los Angeles, ending the Chargers‘ six-game winning streak. McManus had missed in a similar situation against Houston in the Broncos’ previous game, allowing the Texans to escape with a 19-17 win for their sixth straight victory. “This is definitely a team that is much better than their record shows,” said Roethlisberger, whose Steelers (7-2-1) also face the Broncos riding a six-game winning streak . The Steelers present a huge challenge with wide receivers Antonio Brown and Ju-Ju Smith-Schuster — who have a combined 126 catches for 1,673 yards and 14 touchdowns — and in tight ends Vance McDonald and Jesse James, who have combined for 761 yards and five TDs on 43 receptions. With cornerback Chris Harris losing play-making partner Aqib Talib to a trade last spring and Bradley Roby going through concussion protocol this week, the Broncos will try to counter those duos with their own in Miller and Chubb, the NFL’s most productive pass-rushing pair heading into Week 12. 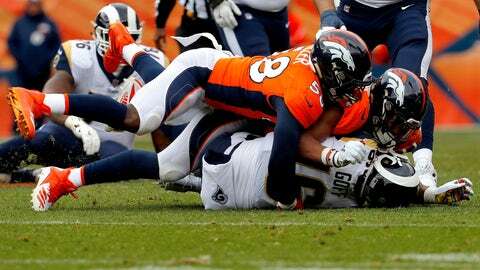 Both have a five-game sack streak going, and their 19 combined sacks are one more than Dee Ford and Chris Jones, each of whom have nine sacks for the Chiefs, and the Rams‘ Aaron Donald (14½) and Ndamukong Suh (3½). Even though he holds on to the ball longer than most, Roethlisberger has long been one of the toughest QBs to take down because of his size and strength. He’s only been sacked 14 times this year. Miller has sacked Roethlisberger three times in four meetings, but he was held without a sack in their last two matchups, the last one coming in the 2015 playoffs that preceded Miller’s monster games against Tom Brady in the AFC championship and against Cam Newton when he won the Super Bowl 50 MVP award. He’s only seen Chubb on video but Roethlisberger said he also has a deep respect for the rookie. “It’s high motor. He just goes. He seems to be very strong. At times, he’ll just go right down the middle of a tackle and there’s times that he’s able to get around the outside with a little bit of speed,” Roethlisberger said. “Maybe the quarterback steps up and then he throws a spin move in there. It’s just never quitting.